Why are Americans so fat? Find out in Super Size Me, a tongue in-cheek – and burger in hand — look at the legal, financial and physical costs of America’s hunger for fast food. Ominously, 37% of American children and adolescents are carrying too much fat and 2 out of every three adults are overweight or obese. Is it our fault for lacking self-control, or are the fast-food corporations to blame? Filmmaker Morgan Spurlock hit the road and interviewed experts in 20 U.S. cities, including Houston, the “Fattest City” in America. From Surgeon Generals to gym teachers, cooks to kids, lawmakers to legislators, these authorities shared their research, opinions and “gut feelings” on our ever-expanding girth. 1) No options: he could only eat what was available over the counter (water included!). 2) No supersizing unless offered. It all adds up to a fat food bill, harrowing visits to the doctor, and compelling viewing for anyone who’s ever wondered if man could live on fast food alone. 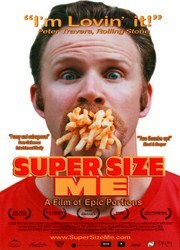 Super Size Me is a satirical jab in the stomach, overstuffed with fat and facts about the billion-dollar industry besieged by doctors, lawyers and nutritionists alike. “Would you like fries with that?” will never sound the same!